Ford Model T owner story – what is it like to own and drive a 1915 vintage Ford car? As part of the carphile.co.uk Owners View series, we caught up with Ford Model T owner Dirk Regter to find out what it’s like to own a Model T but also how he came to drive one over 50,000 miles around the world. Where did your interest in the Ford Model T first start? DR: “At the age of 6 I was already interested in Ford Model T’s. My grandfather and father had a transport company. They had the first car in our town, a Renault. When the Model T’s came (to the Netherlands) the transport company bought a fleet of Model T’s cars and trucks. The transport company did their own repair work and so there were maintenance books and other Model T books always around that as a kid of 6 l was very interested in. After this my father taught me how to drive a Model T”. When did you buy your first Model T? DR: “When I was 16 years old I wanted to buy a Model T but I couldn’t find one so I bought a Model A 1929 Tudor in Denmark. I restored that car and have driven many years in the Model A. In 1990 I bought my first Model T, a 1923 touring from California. I restored that car and drove many miles with that car”. What is great about owning a Model T? DR “It is not difficult to repair a Model T Ford Model T and repair it yourself. There are also a lot of books and Model T clubs all over the world and it is not hard to find good quality car parts. It’s fun driving a Model T and it puts a big smile on the faces of the people we meet, I cannot imagine how life is without a Model T”. What is it like driving a Model T in modern 21st century traffic? DR: “An important thing is that the car is safe, has good brakes, good wheels, good tires and good lights. Cruise control on the steering wheel and hand throttle makes the Model T a very easy and comfortable to drive but I always drive (the Model T) safely. I always say: half the speed gives double the fun”. Powered by a 3.0-litre 4-cylinder petrol engine, Dirks’ Ford Model T is unaltered from its standard 1915 factory specification. The only change is the addition of hydraulic rear brakes for improved safety (which helps on an around the world tour – more on that later). Have you any tips for anyone looking to buy a Ford Model T? DR: Take the time to learn how to drive it. Make it a safe car for the modern traffic. Are you a member of any Ford Model T clubs? DR: “I am a member of the Model T club in Holland, a member of the Model T Club of America, The Crankhandle Club in South Africa, classic car club in Argentina. 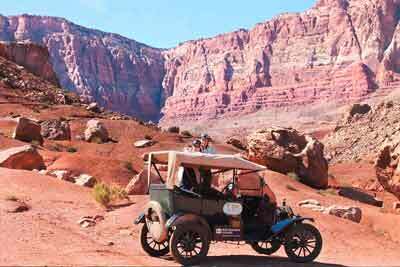 In the Summer of 2012, Dirk and his wife Trudy set off on an around the world adventure in their Model T Ford. So far the couple have covered nearly 50,000 miles, visiting and supporting various projects run by the international children’s aid organisation: SOS – Children’s Villages. 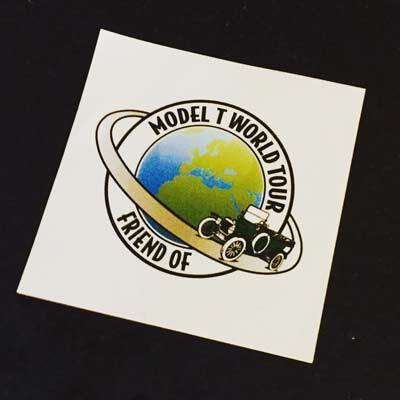 How did the idea for the Model T world Tour come about? DR: In 1997 I bought a book about the first Peking to Paris rally and realized that 2007 would be the 100th anniversary of the very first event. I decided to enter the 2007 rally and (naturally) wanted to enter it in a Ford Model T.
I wanted to enter the rally in an older Model T car than my 1923 touring. So I bought a 1915 touring in the USA and prepared the car for the Peking to Paris event. We wanted to enter the official rally but it became clear that it would be difficult to complete the necessary miles each day in a Model T. So we decided to travel the route on our own. Driving from Peking to Paris (about 10,000 miles) in 3 months with only the Model T and a support vehicle. It wasn’t an easy drive but we made it. The Peking to Paris drive raised money for projects in Mongolia for disabled children. Raising about 135,000 euro for two projects in Bayanhongor and Baruun-Urth. (More information on this tour can be found at www.kilometersvoorkinderen.nl. (Dutch language)). 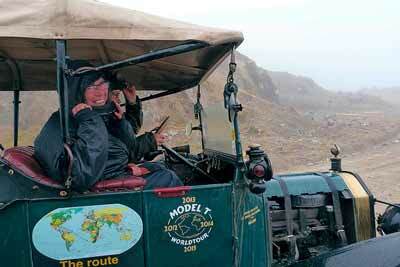 DR: “After Peking to Paris we wanted to do another Model T drive to fundraise for children’s projects. We could not decide which part of the world to travel so we decided to do the whole world. We chose to fundraise for orphaned children as there are orphans are all over the world and we chose SOS Children’s Villages as they are a worldwide organisation, supporting projects for orphaned children in more than 150 countries. In 2012 and our first leg was through Europe and Africa. We visited several projects for orphaned children (see some video’s here). Our 2nd leg was in 2013 through the USA and Canada and the 3rd leg was in 2014 through South America. 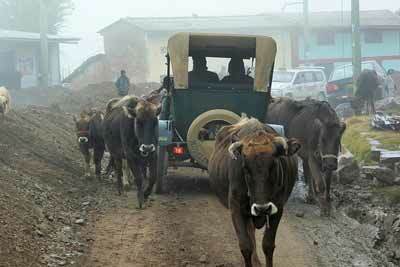 What have been the biggest challenges when driving a Model T around the world? DR: I can write a book to answer this question. All the deserts, all the borders, all the technical problems, all the nice people we have met, having no fuel and having no good tires in Africa, all the very rough roads, 5000 meters high (15,000 feet) in the Andes in Bolivia and Peru, stay in love with my wife, keep smiling. DR: (After the accident) the Model T and the support vehicle, a LandRover, were a total loss. We are now working to restore both vehicles but that takes a lot of time and money, more than the insurance has paid, that’s why we started an international sponsor campaign via our website to help us getting the cars on the road again so we can continue our Worldtour. What is next for the Model T World Tour? DR: Our schedule is to get the Model on the road this summer and at the LandRover by the end of the year. As soon as we can organise it, the worldtour will continue in New Zealand and Australia. Our thanks to Dirk Regter. You can find out more as well as how you can donate to help get the Model T World Tour back on the road here. Ford built 15,000,000 Model Ts between 1908 and 1927. Production started in the US but expanded quickly worldwide and assembly plants were set up in Denmark, Germany, Ireland, Spain and at Trafford Park in the UK. The Ford Model T famously helped put the world on wheels. Not only was it the first mass-produced car but its affordability, reliability and ease of maintenance, in a time when standard parts were rare, all contributed to the cars’ enormous success. In the Owner’s View series, we meet the car enthusiasts who actually took the plunge to buy and now own and drive the classic car of their dreams. If you’re an Ford owner, be sure to check out our owners’ club page to find out about clubs near to you, or for information about club meetings and events.